We’d love your help. Let us know what’s wrong with this preview of Barnyard in Your Backyard by Gail Damerow. When is the right time to shear a sheep? Is there a market for manure? What time of day is best to collect eggs? What is the correct way to milk a goat? What does a duck eat? Can a cow and a sheep share the same pasture? Which types of rabbits are easiest to raise? The perfect book for anyone who has ever dreamed of having that little place in the country, Barnyard in Your When is the right time to shear a sheep? Is there a market for manure? What time of day is best to collect eggs? What is the correct way to milk a goat? What does a duck eat? Can a cow and a sheep share the same pasture? Which types of rabbits are easiest to raise? The perfect book for anyone who has ever dreamed of having that little place in the country, Barnyard in Your Backyard offers tried-and-true, expert advice on raising healthy, happy, productive farm animals: chickens, geese, ducks, rabbits, goats, sheep, and dairy cows. To ask other readers questions about Barnyard in Your Backyard, please sign up. This was a good book and it had a lot of information on geese and other animals. Another Storey publication, another outstanding intro to a country living topic. The author/editor Gail Damerow covers 6 type of animals, chickens, ducks and geese, rabbits, goats, sheep, and cattle and goes into details about housing, care, feeding and things to watch for while raising them and what you can expect out of them in terms in temperament and output. For a novice like me, this introduction to livestock was perfect. It answered all my questions and much more. Not only is the overview pa Another Storey publication, another outstanding intro to a country living topic. The author/editor Gail Damerow covers 6 type of animals, chickens, ducks and geese, rabbits, goats, sheep, and cattle and goes into details about housing, care, feeding and things to watch for while raising them and what you can expect out of them in terms in temperament and output. Not only is the overview packed full of information, the author has a large list at the end of the book of additional information so one can find out more. My low rating is more because the book wasn't what I needed. It was a beginners reference to all different types of potential livestock. I just wanted something on chickens, which was there, but a book specifically for the animal you would like to read is a better choice. This is a good book to read before you decide wether to raise anything or not. It can give you a brief run-down on expectations and work each will require. This is a really awesome book if you are looking to find some basic information about many different barnyard animals. If you want some more specific information, get one of the Storey's Guide books because they are apart of the same series. This is a truly helpful book and one I would recommend investing in. I have it on my bookshelf and it has come in handy many a time. 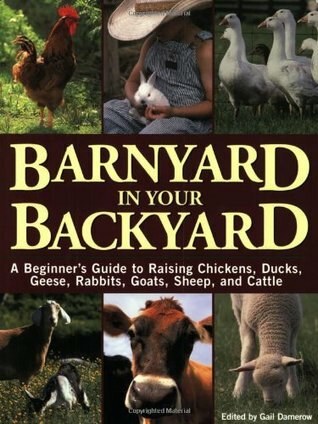 This is a great book for getting a good idea of how to raise barnyard animals in most environments. From routine care to feed schedules to proper buildings, it's a great read for anyone interested in adding livestock to your life. if this title doesnt make you laugh and smile, then fooey on you. I only read the chapter on chickens, but this book covers every other type of animal one might fancy having in their backyard barnyard. I found this book to be an excellent resource manual, particularly when it comes to raising chickens. More illustrations or pictures could have pushed this book to four stars. I was also confused on why the author chose to leave out a section on raising pigs. This is a great book for researching if you might want to get some farm animals. It walks you through initial steps of considering the animal through buying and maintaining the animals. If I move into other animals I would definitely revisit for the information it provides. Great starter book if you are intersted in getting involved with a variety of animals. Gives the basics enough for you to get started and decide which route to go. I continue to use this book for reference. There is a lot of information in this book. Whether you have some acreage or a small plot this book will explain all the who, what, where and hows of having *livestock* at your home. Easy to read and lots of hints and suggestions. It was very helpful to me in making some livestock decisions. I just read the chapter on chickens, because that's the info I needed, but this book provided the best information that I have read to date. Very thorough and informative. We've used this guide to raise chickens and rabbits. Maybe we'll have more space someday and try something bigger. This is my favorite book of all time. Before I added it to my own personal collection, I checked it out 7 or 8 times. Why I chose this book : Acclaimation/Care/Longevity of my Duck. Well that and too understand me...the Rooster, Mwwhha! I love you Monica Maxine Ruiz! Great as a reference. Very useful information if you have a need for it. A very good book, whether you're new to the farm life or not! Lots of illustrations, and very nicely written. Very helpful to our current endeavor. My chickens are most grateful that I learned a thing or two before acquiring them! I didn't read it all the way through. I will save that for the day when I actually decide to get some animals or not. I really enjoyed this book, it covers some great information about raising chickens, waterfowl, sheep, goats and cows. At first I shunned this book because there were no photos of cute animals. But there are drawings, and black and white lines have never looked more lovely. The text part is good, too. A wonderful overview of various barnyard critters: chickens, rabbits, geese and goats. I'm on the way to becoming a self-sustaining hippie.